State 1A Division 2 eight-man football finalists Carey School and Lighthouse Christian Academy amassed top picks in the All-Sawtooth Conference football team selected Monday, Nov. 21 after the conclusion of the Idaho High School Activities Association state football finals. Carey (11-1), the 2011 state runner-up, boasted first-team North Division picks in junior Jordan Dilworth, senior Charlie Rivera, senior Baley Barg, senior Dillon Cenarrusa, junior Glen Andrews and junior Garrett Lee. Newly-crowned state champion Lighthouse Christian of Twin Falls (10-3) had first-team South Division honorees in Gabe Heath, Brad Wall, Kade Evans and Logan Vander Stelt. Coaches of the Year were Doug Astle of North Division runner-up Dietrich and John van Vliet of Lighthouse Christian. Dietrich (5-4) averaged nearly 40 points a game and earned its third straight state playoff berth and fifth in six years—losing at Castleford 44-38 in the quarterfinals. Coach of the Year—Doug Astle (Dietrich). Quarterback—First team: Jordan Dilworth (Carey). Second team: Brody Astle (Dietrich). Honorable mention: Dustin Rosenkrance (Mackay) and Jeff Henson (Richfield). Running backs—First team: Jakob Howard (Dietrich) and Charlie Rivera (Carey). Second team: Gray Weber (Dietrich) and Caden Betzer (Mackay). Honorable mention: Chance Chavez (Carey) and Morgan Johnson (Mackay). Center—First team: Eddie Alvarado (Dietrich). Second team: Francisco Gamino (Carey). Honorable mention: Eric Beezly (Richfield). Guards—First team: Arturo Vargas (Dietrich) and Glen Andrews (Carey). Second team: Colton Hanson (Dietrich) and Garrett Lee (Carey). Ends—First team: Andru Howard (Dietrich) and Baley Barg (Carey). Second team: Jack Cenarrusa (Carey) and Ricky Godin (Richfield). Punter—First team: Baley Barg (Carey). Second team: C. McCammon (North Valley Academy). Defensive line—First team: Garrett Lee (Carey) and Arturo Vargas (Dietrich). Second team: Francisco Gamino (Carey) and Martin Becali (Richfield). 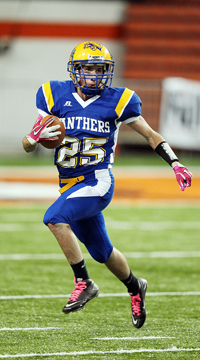 Honorable mention: Colton Hanson (Dietrich). Defensive ends—First team: Dillon Cenarrusa (Carey) and Glen Andrews (Carey). Second team: Tucker Farr (Clark County) and Hazen Weber (Dietrich). Honorable mention: Andru Howard (Dietrich). Linebacker—First team: Gray Weber (Dietrich) and Charlie Rivera (Carey). Second team: Caden Betzer (Mackay) and Chayce Bramwell (Clark County). Honorable mention: Chance Chavez (Carey), Jakob Howard (Dietrich) and Morgan Johnson (Mackay). Defensive backs—First team: Baley Barg (Carey) and Brody Astle (Dietrich). Second team: Jack Cenarrusa (Carey) and Dustin Rosenkrance (Mackay). Honorable mention: Cooper Astle (Dietrich) and Zak Wood (Richfield). Kicker—First team: Ben Robles (Richfield). Second team: Luis Garcia (Carey). Honorable mention: Arturo Vargas (Dietrich) and James McHan (North Valley Academy). Coach of the Year—John van Vliet (Lighthouse Christian). Quarterback—First team: Mitch Howard (Castleford). Second team: Logan Bosma (Lighthouse Christian). Honorable mention: B. Messmer (Jackpot, Nev.) and Ty Teton (Sho-Ban). Running backs—First team: Gabe Heath (Lighthouse Christian) and Humberto Pacheco (Murtaugh). Second team: Ty Zimmers (Castleford) and C. Robinson (Rockland). Honorable mention: Dylan Van Esch (Lighthouse Christian), Destry Weekes (Castleford), Merrill Hall (North Gem) and Devin Devine (Sho-Ban). Center—First team: Logan VanderStelt (Lighthouse Christian). Second team: A. Kirby (Rockland). Honorable mention: L. Miramontes (Jackpot, Nev.), Cody Banes (Murtaugh) and Riley Reynolds (Castleford). Guards—First team: Kade Evans (Lighthouse Christian) and Quentin Van Pelt (North Gem). Second team: Samoa Etelu (Castleford) and E. Sanchez (Jackpot, Nev.). Honorable mention: Tyson Wilkins (Murtaugh). Ends—First team: Brad Wall (Lighthouse Christian) and Cody Hansen (Castleford). Second team: Kendall Lloyd (North Gem) and P. Perez (Jackpot, Nev.). Honorable mention: Troy Banes (Murtaugh). Punter—First team: Daren Hester (Jackpot, Nev.). Second team: Merrill Hall (North Gem). Honorable mention: Devin Devine (Sho-Ban) and Eli Spillet (Rockland). Defensive line—First team: Samoa Etelu (Castleford) and C. Hidalgo (Rockland). Second team: Trentan Lessley (Lighthouse Christian) and Andre Briggs (Lighthouse Christian). Honorable mention: Everado Sanchez (Jackpot, Nev.) and Danny Pine (Sho-Ban). Defensive ends—First team: Destry Weekes (Castleford) and Kendall Lloyd (North Gem). Second team: Donnie Aardema (Lighthouse Christian) and Loren Rector (Castleford). Honorable mention: D. Duba (Rockland), Devin Devine (Sho-Ban) and J. Plancenscia (Jackpot, Nev.). Linebackers—First team: Merrill Hall (North Gem) and P. Perez (Jackpot, Nev.). Second team: Dillon Wilson (Lighthouse Christian) and Cody Hansen (Castleford). Honorable mention: Weston Thompson (North Gem), Tanner Allred (Castleford), C. Robinson (Rockland) and Darven Jake (Sho-Ban). Defensive backs—First team: Austin Stanger (Murtaugh) and Mitch Howard (Castleford). Second team: Philip DeMello (Lighthouse Christian) and Tyler McClain (North Gem). Honorable mention: Ty Zimmers (Castleford), K. Kunkel (Castleford), Eli Berndt (Lighthouse Christian) and Ty Teton (Sho-Ban). Kicker—First team: Johnny Martinez (Jackpot, Nev.). Second team: Riley Reynolds (Castleford).